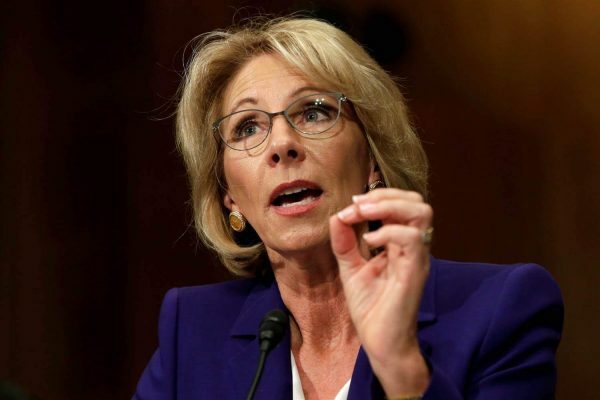 Not only did Donald Trump’s Secretary of Education nominee Betsy DeVos turn in an inept performance during her Senate confirmation hearings which revealed she has no idea how public schools work or which laws apply to schools, it turns out she’s apparently also some kind of secret anti-gay crusader. In fact for the past seventeen years she’s been the vice president of an anti-gay foundation — and now she’s acting shocked to learn this information. According to tax records dug up by CNN, Betsy DeVos has been the vice president of her mother’s “Edgar & Elsa Prince Foundation” since the year 1999. And according to SourceWatch, the foundation in question has donated to every anti-gay faux-christian hate group under the sun, including Focus on the Family and the infamous Family Research Council. So how does DeVos explain away her apparent status as an anti-gay crusader, when she wants to be in charge of the nation’s schools which include millions of gay students? DeVos claims she has nothing to do with her mother’s foundation, and she’s only been listed as its vice president for the past seventeen years due to what she calls a “clerical error.” This is even worse than when she said she wants guns in schools to fend off grizzly bears.